1. If you aren’t already a huge fan, take some time to learn about English football. 3. Choose your Premier League Football tickets wisely. Football (also called soccer in the US) is the most popular sport in the world. But even given its worldwide popularity, football still holds a special place in England’s history, where evidence of a “kicking game” played in London dates back to medieval times. Over the last thousand years, football’s popularity in England has only grown, with over 40,000 association football clubs, more than any other country. 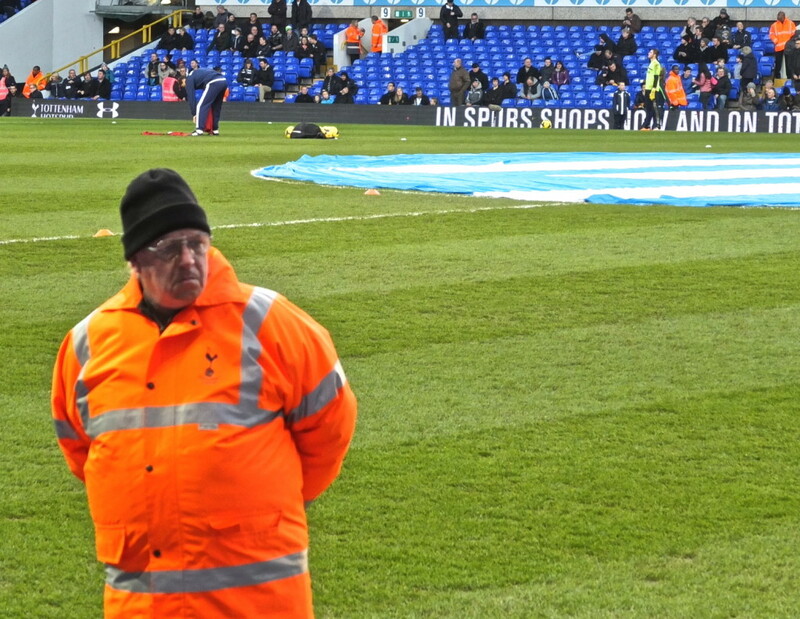 Tottenham Hotspur (nicknamed “Spurs”) play West Bromwich Albion (the “Baggies”) at White Hart Lane in North London. Seeing a football match in England as a tourist allows you to join locals in taking part in a beloved historic tradition, and gives you an inside view of this sport that has become a part of British culture. So get your tickets and join the estimated 900,000 tourists a year who attend British football matches each year. 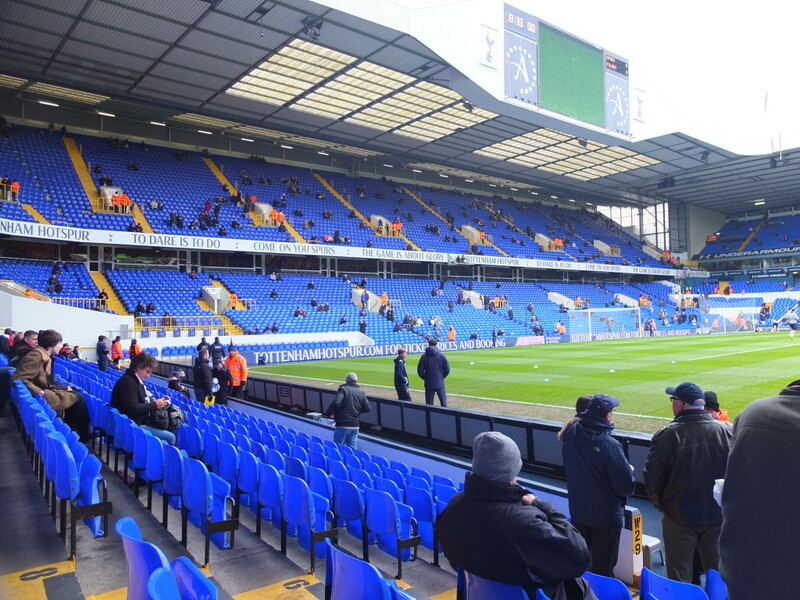 Tottenham Hotspur (“Spurs”) play West Bromwich Albion (the “Baggies”) at White Hart Lane in North London. England’s football league system is based on a sometimes complicated (to an outsider anyway) pyramid structure, based on the principles of promotion and relegation. Because of the widely televised matches, most tourists (especially Americans) are familiar only with the highest level league at the top of this pyramid, Barclays Premier League Football. Maybe you aren’t a footy fan yet, but have a love of sports or played soccer when you were young, and are curious about what this football business is all about. If you are interested in learning more about English football, it’s definitely worth reading up on some of the intricate rules beforehand– it will make seeing the live match a lot more fun when you can join the others in letting that ref know how your striker couldn’t have been offside. 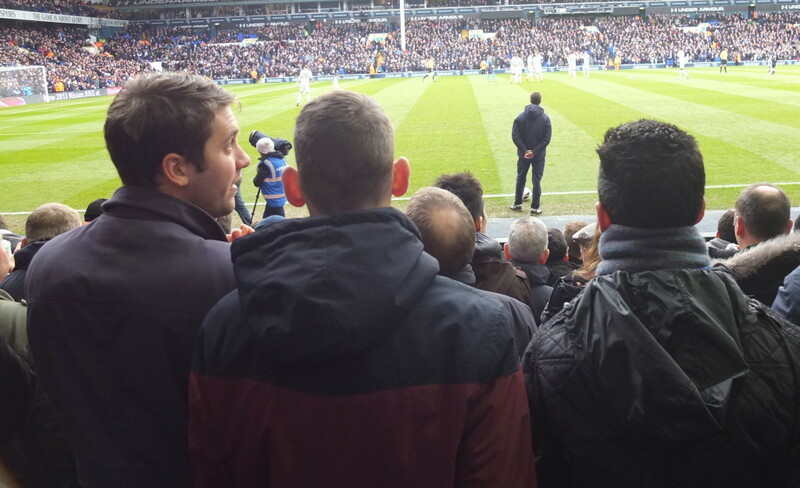 Fulham and Tottenham Hotspur at White Hart Lane in North London. Also, if you don’t already, start watching English football matches on television. In the US, Barclays Premier Football league games are broadcast on NBC Sports Network. Better yet, find a local bar that plays the matches and get to know other fans. Perhaps most importantly– pick a club to support and stick with them. The Brits are not known to be fair weather fans. Make sure to check the Barclays Premier League Schedule (also called a fixture list). (Click here for the schedule). Keep in mind that matches are subject to change, particularly in the second half of the season due to conflicts with the FA Cup and Champions League. The availability of tickets will vary based on the club, but is not always directly tied to the club’s popularity. While popular clubs have more fans, they also have larger stadiums to hold those fans. Tickets are usually first made available to club members, with any remaining then going on general sale. 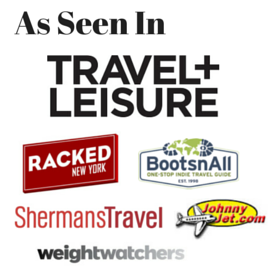 Whether you should join the club before buying tickets will again depend on the club (membership with ticket buying privileges usually involves a fee, we paid 45 pounds to join our club). You may want to call the club directly to ask whether it’s worthwhile to join the club, especially if you’re only planning to see one match. You can also check out various online forums (Reddit has subforums, called “subreddits,” for each Premier League Club). If you can’t get tickets through official channels, you can always try third-party sellers like Stubhub or Viagogo (but be wary of sites like Craigslist, which are full of scams). Do not, under any circumstances, sit in the opposing team’s section. If you’re seeing your club at their home stadium, this means turning down any seats in the “away” section, even if they are better than any other available seat in the home section. The most ideal seats for viewing the match are dead in the middle of the stands, side-on to the pitch. These are usually held by season tickets holders and may be hard to come by. The most ideal seats for atmosphere are (usually) end-on to the pitch. Because the most fervent supporters often tend to sit here, the is a great place to sit if you want to join in on the singing and chanting. Some home fans are known as being particularly loud and fond of singing, e.g. Liverpool, Crystal Palace, Tottenham, while others have a reputation for being quieter, whether deserved or not, e.g., Fulham, Arsenal. Whether you want a high seat or low seat is a matter of personal preference. As when choosing seats at the ballet, sit high if you want to see the big picture view and formations. Sit low to see the expressions of the players and the hear the slap of the ball. If you’re staying in central London, some stadiums may only be a short tube ride away. Crystal Palace’s ground is Selhurst Park in South London. Other grounds may involve a few modes of transport, including buses, the overground and walking, so check out sites like HopStop for door to door directions and time estimates. Bell & Hare Pub near White Hart Lane, North London, a favorite for supporters of Tottenham Hotspur. 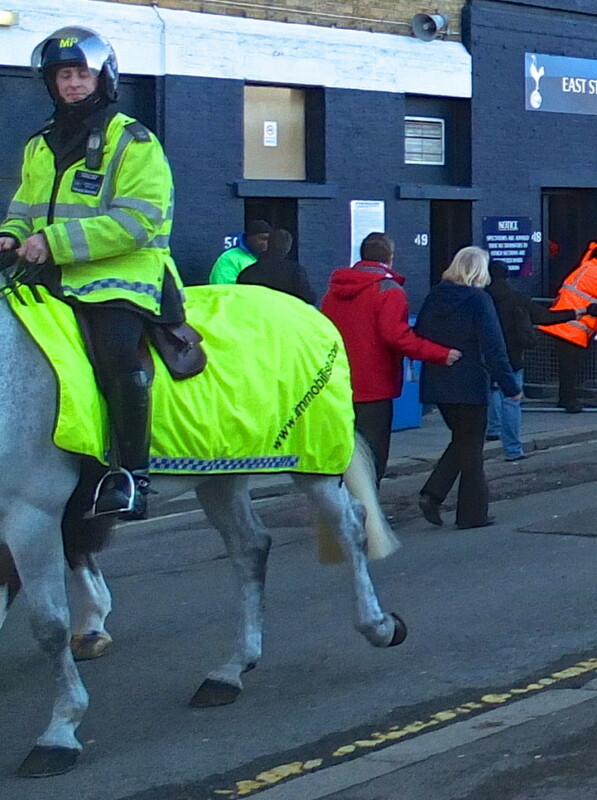 It can be fun to get revved up for a football match at a pub with other supporters near your club’s home stadium. 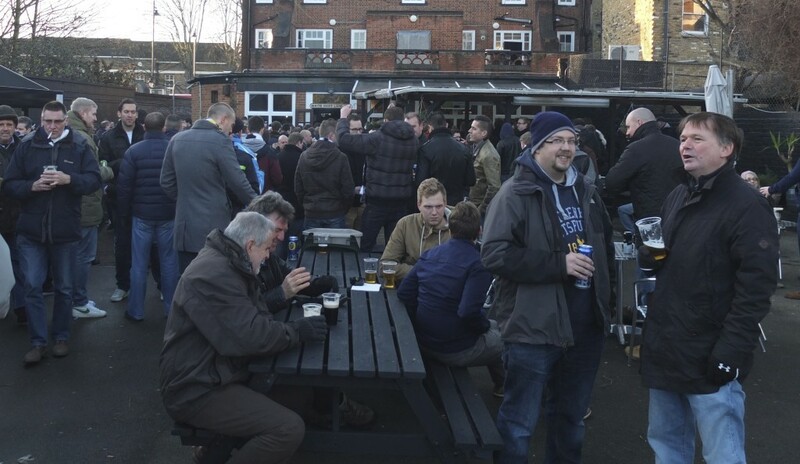 Most of the pubs near the grounds are segregated and will only allow in one club’s fans– entry is restricted to those with a home ticket or proof of club membership. There are usually signs outside the pubs (and a big doorman) to prevent the wrong club members from accidentally wandering in. Don’t be deterred by a heavy police presence (often on horses, sometimes in riot gear). Matches are considered family friendly these days and the police are there “just in case”. 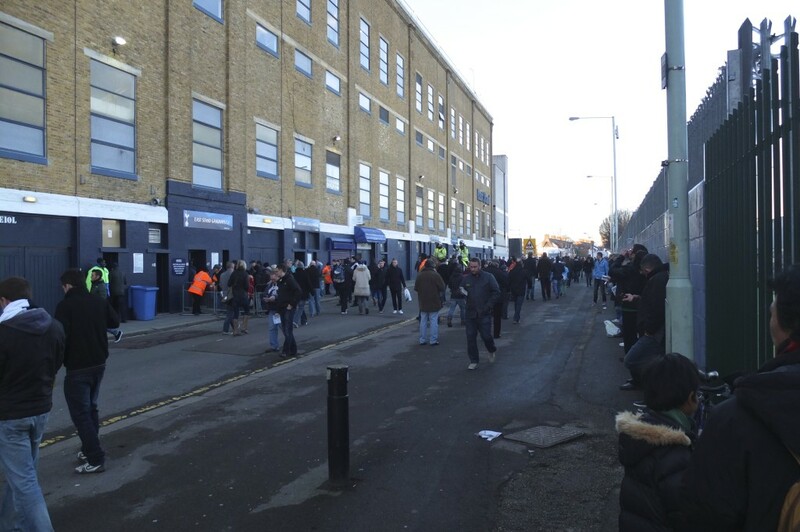 One of the stadium entrances at White Hart Lane, home of Tottenham. Don’t drink within sight of the pitch (the field), it’s strictly forbidden. Americans who are used to drinking beers in the stands may be surprised at this– there is absolutely no drinking anywhere in the stands. The rule of thumb is if you can see the pitch, you can’t drink. The only place you can drink right is outside the stands in the concession area or in the executive boxes. Don’t expect the food to be delivered to your seat. In an American baseball game, the slow action is broken up by a visit from the hot dog guy. Followed by the peanuts guy. Then maybe the ice cream guy. In English football, there are no vendors delivering a buffet of snacks to your seat. You’ll have to hit the concession stand yourself.What kind of snacks can you expect? Sausage rolls, pies (the English kind), cups of steaming Bovril or tea and of course a pint are traditional. One of the signature odors at a match is Bovril and pork pie. Almost everyone eats at a match (or just before at one of the burger carts surrounding the stadium). Get to the stadium early and watch the your club warm up. 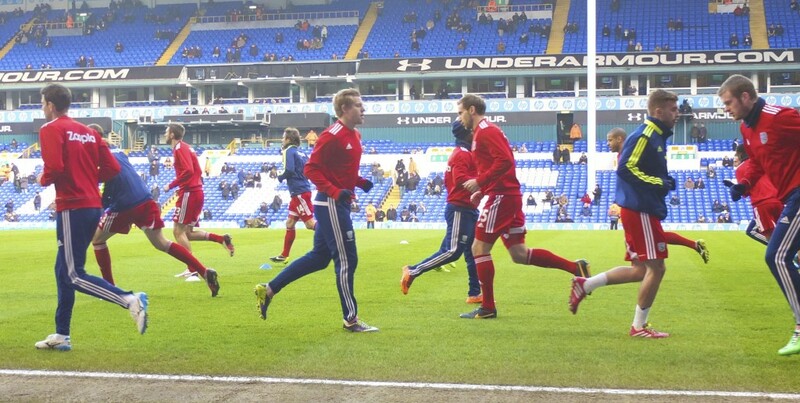 Watching the players warm up is great way to extend the match day experience. 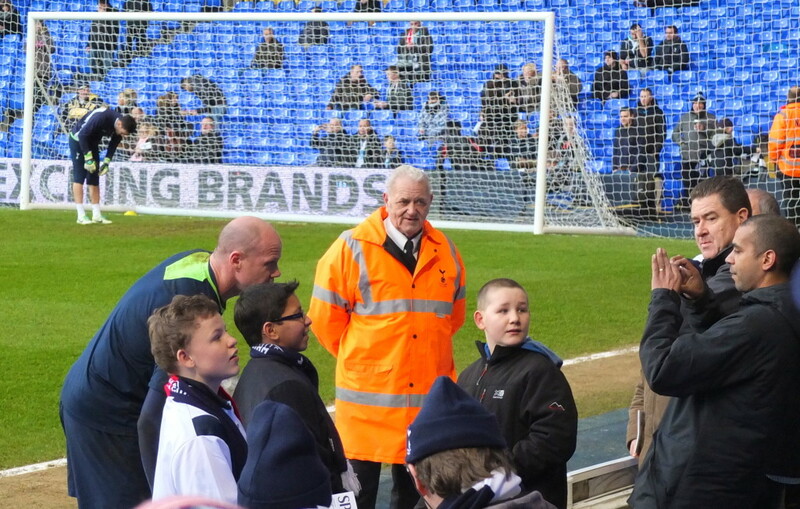 And maybe even pose with a player for a photos– but you’ll have better luck if you bring cute kids. Forget looking out for cheerleaders, other than a few rare exceptions, you won’t find any. In English football, the fans lead the cheers through songs and chants. Feel free to join the locals in hurling amusing and inventive insults, or sing along to traditional songs (often with new lyrics improvised on the fly). Instead of just witnessing the match as a spectator, you can become part of the game. Don’t stand up unless everyone else around you does (stewards can get a bit peeved at times). Don’t wait for a long timeout to hit the loo. Unlike American sports known for long, drawn out tv timeouts, in English football there are no long breaks in the action. Plan on being present for the full 90 minutes. 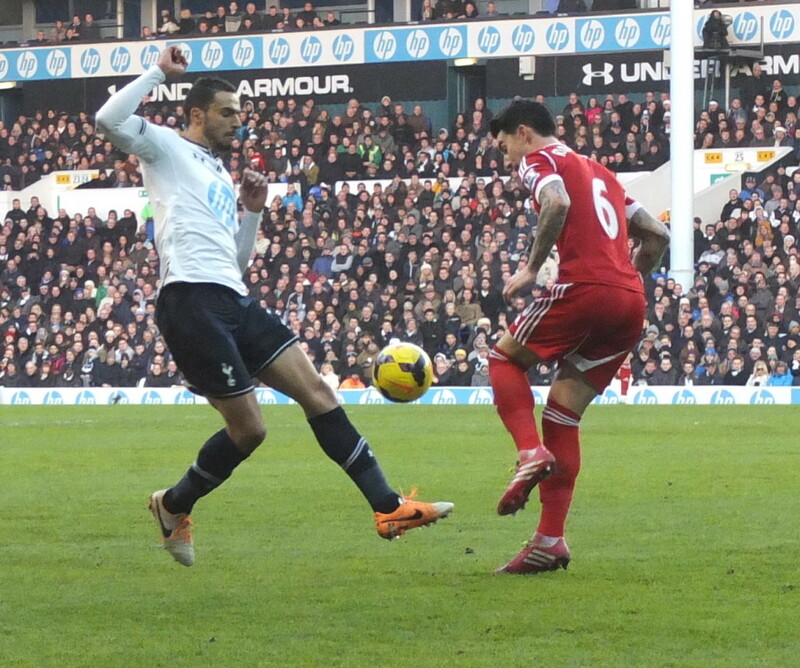 Fulham and Tottenham Hotspur play at White Hart Lane. 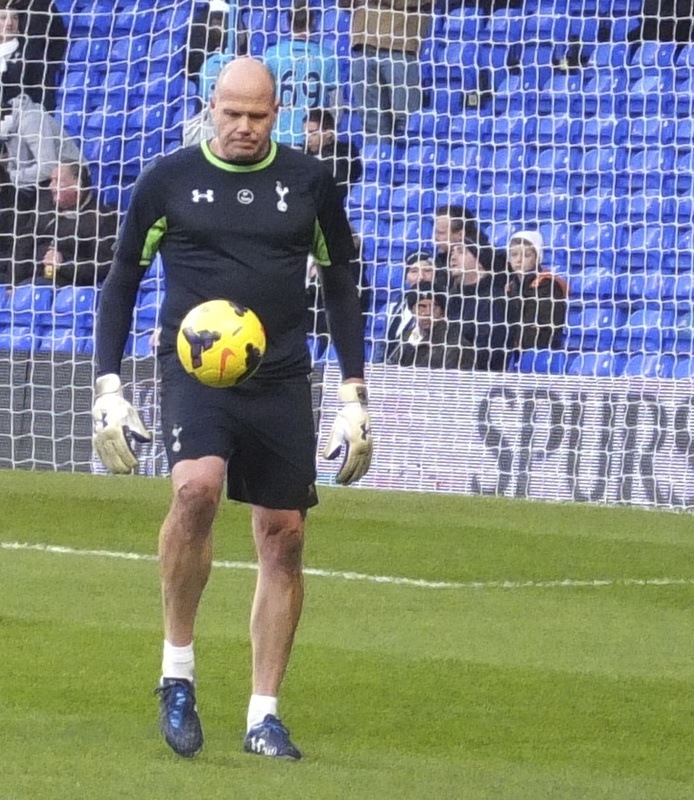 Tottenham Hotspur goalkeeper (and American) Brad Friedel. Do keep your eyes on the field for the action. Unlike in American football, there are no “fancams” or annoying music competing for your attention. The real action is on the field. Buying souvenir English football items is all part of the football experience. Like sport fans everywhere, English football fans love to show their support by wearing their club’s shirt (and other items from the club’s “kit,” or uniform). But what separates football fans from fans of other sports is the century-old tradition of wearing scarves with their club’s colors. While the storied tradition alone is reason enough to buy a football scarf, it also makes an ideal souvenir for purely practical reasons. When you’re sitting in the stands on a brisk day, with piles of layers hiding your favorite football shirt, you can still show off your club pride with your colorful scarf. Even the club’s managers along the sidelines, smartly suited up, favor a colorful team scarf on match day. While there are no real rules about how to wear your football scarf, on game day you may want to drape over your shoulders so you can easily hold it up over your head at the match to show your support. Not sure what Barclays Premier League Football Club to support? I asked some fans to show off their club’s shirts and kits tell us why you should consider supporting their favorite club. Don’t see your club represented here? Send me a photo and I’ll add it to this post! 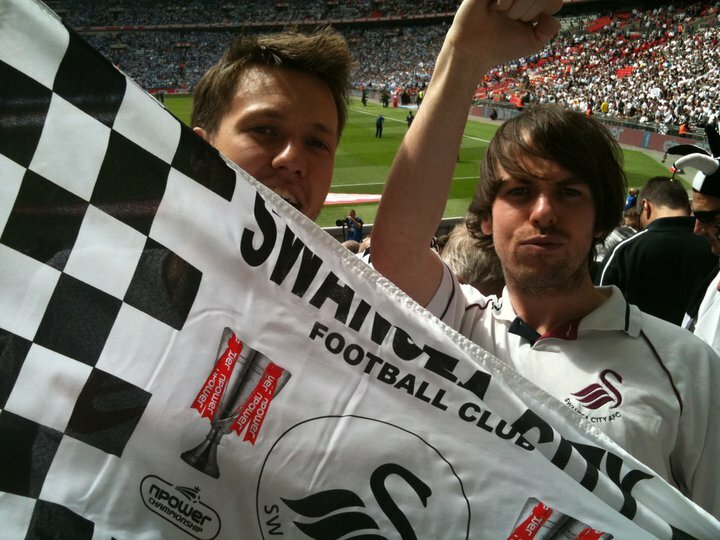 Adam wears his Swansea City shirt and waves a banner in support of his club. If any club epitomises triumph over adversity, it’s Swansea City! In the last decade, the Swans have gone from almost being relegated to the semi professional leagues in 2003, to becoming the first Welsh team to reach the Premier League in 2011 and then winning the Carling Cup last season. Unlike local rivals Cardiff who’ve been cringingly ‘rebranded’ by their millionaire Malaysian owner, it’s all been overseen by a group of Swansea fans that took over the club back in the dark days. And, if that isn’t enough reason be a Swansea City fan, don’t forget Swansea is the furthest west team in the league, so they’re every American’s ‘local’ Premier League club! Tickets go on general sale for many home games – try and be in the Croeso Stand for the best atmosphere. 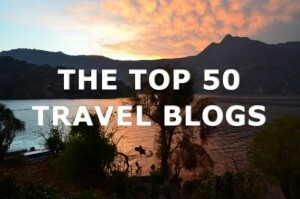 Follow Adam Evans’ fantastic travel blog at Adam off the radar and on twitter @adamofftheradar. 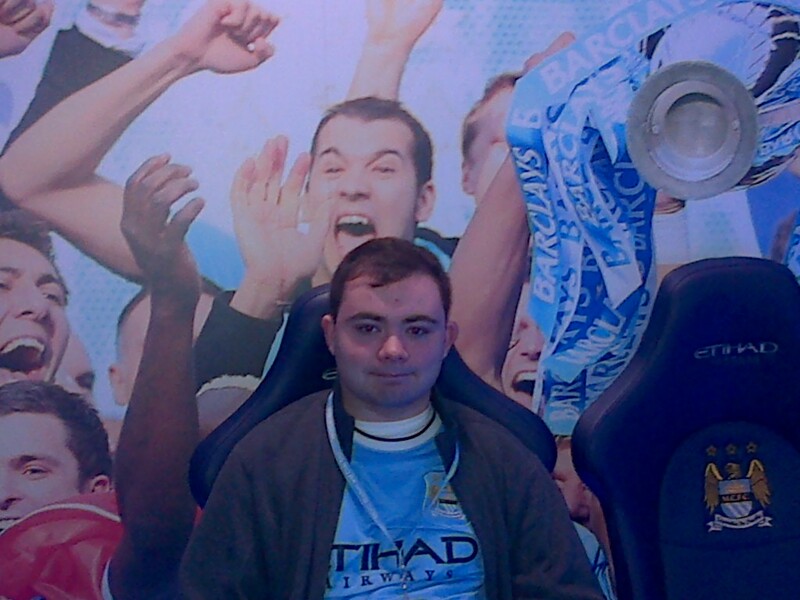 Manchester City supporter Kyle D. wears his club’s shirt while on a guided stadium tour. Arsenal Arsenal (also known as the “Gunners”) is one of the most successful clubs in English football– which makes it difficult to get tickets to their matches, as they nearly always sell out. To gain a perspective on Arsenal fans, watch the excellent film Fever Pitch (the British version, NOT the American version), based on Nick Hornby’s book. Tottenham Hotspurs (called “Tottenham” or “Spurs”– call them Hotspurs and you’ll give yourself away as American)– are known for their “attractive attacking football.” Motto: Audere est facere– to dare is to do. Have you checked out a Premier League match while visiting England? Do you have a favorite club? Tell us about in the comments below! I will admit to previously knowing nothing about English football. Why is I was particularly interested in your advice about going to a pub first. Of course this makes sense when reading that no alcohol is served in the stands. Very different from North America indeed. Hope you are enjoying Jamaica, I am hoping to see some photos with little umbrellas! I was trying to get a ticket to see Chelsea vs. Man United a couple years ago, but tickets were going for 200+ pounds each! I decided that was too many pints to give up and went to a nearby pub to watch the match instead. Yikes that is pricey! I would have gone for the pub too– that’s a lot of pints! trip to England is my dream, Watching Match Manchester United,, Great Post! When me and my friend went to a MLS Vancouver Whitecaps game once, he told me about the no drinking in the seats in England, and I had to say, I was surprised. He told me about guys carrying several beers in the concourse (In North America, at any sports venue, they only allow you to have 2 at a time.). He also told me about the no frills approach to in game experience, like no fan cam or obnoxious stuff, which I’m all for. I would like to see a game in London (It doesn’t matter who, just as long as it’s the Premier League. My friend is a Sunderland fan, so I would look out for them.). I figure after the 2015-16 schedule comes out, I will be able to decide which team’s fan club to join, because that looks like the only way (And the match up would probably have to be one big 4 team or top 10 team at the most against a lower, in danger of relegation team (or 2 lower level teams), because it’s just easier to find tickets that way.). Completely different system when it comes to buying tickets than in North America. I think it makes it a little more difficult for outsiders who just want to see a game, actually. We’re used to expensive sports tickets in North America, and personally, I don’t think BPL tickets are that pricey in comparison. They cost a bit, sure, but it’s not like NFL tickets. It’s just the access to buying them that is the bigger problem. Stubhub works differently in England than in North America, too, because you also have to be a team’s fan club member to buy resale tickets as well. Hey, I’d like to pick up a Tottenham Scarf but don’t want to travel all the way up to north London to get one. Is there a spot where I can get one more in the central part of the city? Yes, try Lillywhites right in Piccadilly– I’ve picked up a Tottenham scarf there before. I’m an american traveling to London for Holiday and I also happen to be a Spurs fan! I plan on watching my first Premier League Match (vs. Man U) and I found this article very helpful! THANKS!!! I am so happy I found your post! Being an American and a huge Spurs supporter it was great to see all the WHL examples. It is my dream to come over with my family and see a match and mingle with the supporters. I will say, being from Alabama where we thrive with college football in 100,000 people stadiums and large productions at every game. We have a great time meeting fans from other teams and we treat em better Than family but I know that’s not the case there! Thanks again for the post and the best part was the last pic when I learned of the author. COYS! Hi there – nice article! I am a huge Spurs fan and appreciated all the pix. I will be in London this fall and would like to attend a match at WHL (I’m waiting to plan my trip after the next BPL schedule is announced next month). I’d very much like to get seats in the Lower West Stand, as close to the front as possible. As an American, I am not a member of the club, although I suppose I could join if it would help. Would you recommend using Stub Hub and winging it, or should I plan on joining and trying to get tix that way? I will probably be going solo – my son will be in school and my daughter is only 4, so probably not too interested. Any tips would be great! Thanks! I got my ticket by buying a Lillywhite One membership which costs 42 British pounds now. Then you can buy tickets directly off their website the moment they get released for that membership level, about six weeks before the match you want to attend. There were plenty of seating choices last season but the 2016-17 season will have fewer seats as the north stand I hear will be gone as the new stadium is being built. I can’t speak to what your options would be with Stubhub but have several friends who have attended matches there in seats they bought there. Lilywhite One gets you some other benefits/discounts like a period when you can order Spurs merchandise with free shipping. It was great finding your article. Like yourself, I am a huge Spurs fan and I’m in the beginning process of planning a trip to London in September 2015. My biggest concern at this point is getting over there and not being able to find tickets. Do you have any tips on how I can guarantee some tickets to a game? I’ve already checked the FIFA site and determined there aren’t any international weekends during the time we’re looking. Is it work paying the $30-$40 to become a member of the Spurs fan club to get tickets? Any help would be gratefully appreciated. Thanks! COYS! Haha I’m trying to be neutral in the post! Joining the club as a Lillywhite (the lowest level) gives you advance purchasing rights (a few days to a week in advance)– even then it’s possible that it might be sold out if the higher levels buy up the tickets (if it’s a really popular match). As a member, you get a lapel pin, some discounts on the online shops– hard to say whether the actual “value” is there if you’re only seeing one match, but it’s fun to join and to get the packet in the mail. The other option of course is Stubhub, where you’ll pay more (again depends on the match) but you will definitely be able to get a ticket. 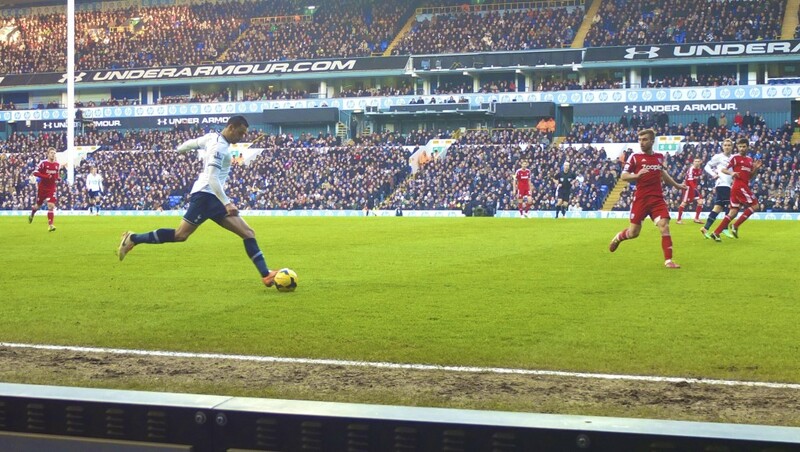 Also check out the r/Coys subreddit– very lively discussion and you can get more advice there. Its wonderful to see the yanks discovering the “beautiful game”! Can’t believe it took you so long! this is a pretty good post. I was looking for info about carrying a backpack in, as I will likely be running scared to make it to WHL from Paris on time. Paris Noord > St Pancras Int’l > Hostel > Liverpool St Station > WHL Station > WHL!!! Saw the boys in Chicago, now to see a competitive game! Hi there! Can a 17-year-old guy attend a match on his own? Are there any restrictions as regards age? Thanks! I haven’t heard of any! Can I carry my camera (DSLR) to the stadium? I am traveling to England in August, I really want tickets to the Crystal Palace vs Arsenal game on August 15. Any advice? If you don’t belong to the club, it can be hard to get tickets. Check stubhub maybe? Away tickets are harder (especially for a match like this) because of the limited allotment (realistically you would have to buy them through the Liverpool club— where they would all be in the away section). On stubhub or other reseller they should be designated away (make sure you ask if they’re not, you do NOT want to be cheering in the wrong section at this match!) Good luck and report back if you go! Me and my brother are going to London from September 10th-17th. The London EPL teams in town that weekend are Arsenal, Crystal Palace, and West Ham (Tottenham would have been one of my first choices because it’s the last year in their stadium (which I like), they’re a higher up team, and it seems like their tickets are not as impossible to get as other elite teams. Like, if I became a member, I could get decent seats for Spurs on Stubhub if I had to, as a last resort. Instead, they’re way up in Sunderland. If my friend was coming along on this trip, we probably would have gone up there for that one and, from what I hear, gotten tickets easily.). Now, I’m not picky about the teams, just as long as I get to see ONE Premier League game and my seat doesn’t have an obstructed view. Arsenal would be impossible to get, so they’re out, right off the bat. Crystal Palace, with the way their membership works, and playing Man City that week, we would probably have to have a certain amount of loyalty points to get that game. So, West Ham it is. They were always an option of mine, another team playing their last season in an old stadium. Sounds good to me. Me and my brother ended up buying West Ham memberships to get tickets for their game against Newcastle. They’ve yet to go on sale, but I tested selecting tickets for the first two EPL home games of theirs that are currently on sale on their site, so that I’ll know what to do when our game is up. West Ham/Newcastle was originally a Saturday afternoon game, but it ended up getting bumped to Monday night. This leaves the Saturday open. I’m not going to try to get tickets to any of those previously mentioned teams, It’s too much trouble. I looked at the Skybet Championship schedule and it looks good. QPR is playing an early game on the Saturday (vs. Nottingham Forest) and I’m staying in Shepherd’s Bush, so that’s a natural choice. I like their stadium and they would have been one of my choices for an EPL match if they weren’t relegated (And maybe the relegation will help my chances getting tickets to see them. The fans have to be a bit restless, I figure, with their team unable to stay in the top league.). If not them, Fulham is playing at home the next day. So, two games in one trip will be great. I have a chance to be in London this fall and I would like to get two tickets for seats that are together for the October 17 Spus vs Liverpool match. As I understand it I would need two club memberships to buy directly from their ticket office. I’m going to assume that tickets though the THFC ticket office will sellout fast for this big match. The other alternative is StubHub and I have no experience with buying though their site. I’m leaning toward SubHub but I’ve also seen a comment elsewhere that for a big match like this one that buying tickets through StubHub might not be so straight forward if demand is very great (something about maybe needing to be a Spurs club member first). When would tickets for this match start to become available on StubHub? How soon do season ticket holders begin to sell their seats? When’s the best time to get them through StubHub? Sorry for all the ??? but this will be my only chance to make the pilgrimage to White Hart Lane before its gone. Any further input would be greatly appreciated. We bought Crystal Palace v Fulham tickets (pre-season friendly for August 2) online no problem. 10 pounds for adults and one pound (one pound!) for kids. They even mailed the tix to us in Toronto for free (I indicated I would pick them up at the ticket office game day, but they went the extra mile). 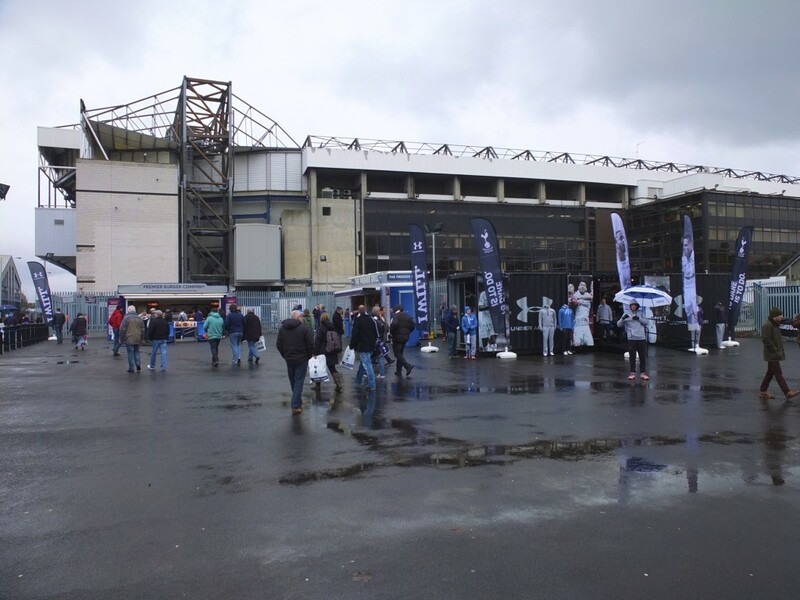 It should be fun – Fulham’s home field (called Craven Cottage) is right on the Thames, and the word is that it is a family friendly atmosphere. Jason- thanks for the info! Sounds like it will be a fun match, would love to hear how it went! What are your thoughts on bringing kids to a match. They are one and three. Bit late, but I just came across this article. A few points: Craven Cottage is in Fulham, not Hammersmith; the Emirates Stadium is located in north London (N7), not north west London; and it’s Tottenham Hotspur, not Tottenham Hotspurs. Thanks for corrections, much appreciated I’ll make the edits! Hotspurs a typo egads! Thank you, I put a lot of work into it, glad it was helpful!